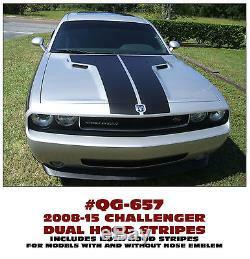 2008-15 DODGE CHALLENGER - DUAL HOOD STRIPE KIT 4 piece kit does hood and nose as shown in photos. Will fit models with or without nose emblem. CHOOSE A COLOR: Matt Black (Flat) #22, Black Gloss #12, White #10, Silver Metallic #120, or Red #53. Thank you for considering Graphic Express Stripes and Decals. Graphic Express manufactures automotive stripes and decals for Ford Motor Company. And Mopar, Dodge, Plymouth vehicles. The item "QG-657 2008-15 DODGE CHALLENGER DUAL HOOD STRIPES with / without EMBLEM" is in sale since Wednesday, March 25, 2015.